Construction News and Report Publishing Group president Mark Buckshon has written Construction Marketing Ideas: Practical strategies and resources to attract and retain profitable clients for your architectural, engineering or construction business. 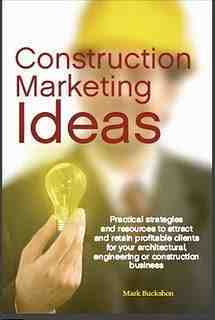 You can learn more about the book at the Construction Marketing Ideas blog and purchase it there or at a diversity of print and e-book retailers, including Amazon.com the IPad store, and Smashwords.com. If you are have paid for an advertisement in GTA Construction Report in the past two years, you can request a free copy of the book by emailing buckshon@cnrgp.com. Marketing advice and consultation is FREE for all GTA Construction Report advertisers. We believe that all advertisers should achieve tangible results from their investment, and the resources in the book and at the blog are supplemented with individualized consulting and guidance on request. Notably, the book has sold hundreds of copies around the world to businesses who would have no reason to advertise in GTA Construction Report. You can see readers’ reviews at the Amazon.com site.